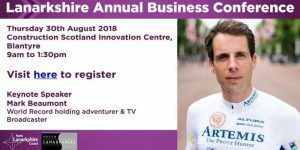 Mark Beaumont, translating adventures into business advice. I learned a new phrase the other day and it puts a lot of the exercise I do into perspective. ‘Type II Fun’ is the kind of stuff that hurts – really hurts – while you’re doing it, and you only start to enjoy it once it’s over. It’s stuff like a killer circuits class or a tough endurance race in appalling weather conditions… the sort of activity that will give you bragging rights if you succeed. According to my Facebook page, while I was living it up at a black-tie birthday party last weekend there was a lot of Type II Fun happening here in the north of Scotland, from The Beast Race on the shores of Loch Ness to the 144km Bealach Mor cycle sportive, taking in the UK’s biggest road climb over to Applecross. I didn’t hear the phrase used in the context of either of those events, though, I heard it from cyclist Mark Beaumont, who was talking about his successful attempt to cycle around the world in 80 days. Mark was the keynote speaker at a business conference I was hosting, and with tales of his seemingly impossible achievements – and some of his failures – he entertained a capacity audience. And while most in the room would have been happy to have simply listened to tales of his adventures, including twice circumnavigating the globe by bike, cycling the length of The Americas and Africa, and setting the record for cycling the North Coast 500 (since beaten, but I’m sure he’ll tackle it again), what Mark did was translate what he has learned from the planning and execution of his adventures into lessons for business. Too good not to share, here’s what I took away from his talk. Mark’s first lesson to us all was to think big. “You’ll never achieve more than you start out to do,” he said, and used his two ‘round-the-world’ cycles to illustrate. The first time his aim was to break the world record of 276 days for 18,000 odd miles, and he did it. His aim was to complete in 195 days – he finished in 194 and 17 hours. And while the world was in awe of him ‘smashing’ the record by over two months, there was a niggle… If he had aimed to do it even faster, would he have achieved that too? The second attempt proved that he could. “Around the World in 80 Days” succeeded, although it required him to cycle an average of 240 miles every single day. Type II fun indeed, and the bragging rights include a book and documentary. Unlike Inverness woman Jenny Graham, who is currently crossing Canada on her attempt to become the fastest woman to cycle round the globe unsupported, Mark’s 80-day extravaganza needed a team, and that was his second business lesson – surround yourself with an experienced, cohesive team you can trust. His 40-strong workforce handles everything from travel logistics to PR and from nutrition and hydration to physiotherapy. Two of the team, while not specifically qualified, were able to perform rudimentary dentistry when he flew over the handle bars and smashed his front teeth. And his third lesson? Not to faff. To cover the required average of 240 miles every day Mark needed to be on his bike for four sessions of four hours each – 16 hours in the saddle. That didn’t leave much time for everything else – resting, rehydrating, refuelling and recording the media clips that would be sent to well-wishers and sponsors, so time was precious. Even five minutes of faffing every time he got on and off the bike would, he calculated, waste almost a whole day over the two and a half months, putting the 80-day target in jeopardy. So, no faffing. Mark talked about the importance of being psychologically tough, of having to be ruthless if team members couldn’t get on with each other, and of people’s true colours only coming to the surface when the chips were down. Which of the six-strong team were prepared to dive under the capsized hull of their rowing boat in the mid-Atlantic to retrieve the rescue equipment to save their lives? Only two dared to try, and it wasn’t the athletes who has been chosen for their rowing abilities, but the adventurers who had been chosen for their grit. But really, his advice boiled down to these three nuggets; aim high, surround yourself with good people, and stop mucking around. Advice for adventurers and business? That’s sound advice for life. Mark Beaumont will be appearing at Eden Court Theatre, Inverness on Tuesday 11th September 2018. This post first appeared in Seven Days, published by SPP and issued with The Inverness Courier, The Northern Scot and four other titles across the north of Scotland, week ended 7th September 2018.